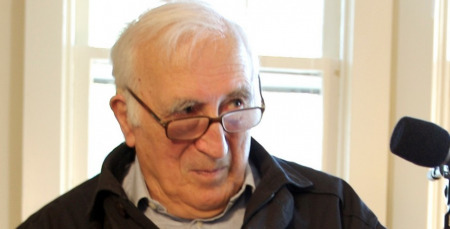 L'Arche founder Jean Vanier yesterday received the 2013 Pacem in Terris Peace and Freedom Award, writes Holy Irritant Tony Robertson. On Sunday July 7 the village of Trosly-Breuil hosted an International event that saw its famed son, Jean Vanier receive the 2013 Pacem in Terris Peace and Freedom Award. Jean Vanier, founded the L'Arche Federation in the village in 1964, the same year the Pacem in Terris Peace and Freedom Award was created. L'Arche is an international community of people with and without disability sharing life across cultural religious and human diversity.The award was presented to Vanier by Bishop Martin Amos of Davenport. This is the first time since its foundation in 1964 that the award has been presented outside the United States. Paul Sinnappan Savriamuthu, Malaysia’s ‘barefoot co-operator’, told how a Young Christian Student group, children of impoverished Indian plantation workers, began a credit co-operative which loaned money for items such as a pencil or rubber. That initiative has now grown into a network of community-based credit co-operatives benefitting the homes, health, education and savings of over 64,000 families. Malaysia’s Catholic Bishops later supported the development of this model among Hindu, Islamic, Buddhist and indigenous communities. Paul has also been engaged by NGOs to teach this model around South-East, East and Central Asia and the Subcontinent, as well as into North America. In China they adapted a popular microfinancing program already underway to ensure that its (women) members accumulate savings and equity in addition to the access to credit provided by the Grameen Bank model. Scores of community banks are now in existence as a result. John Dear SJ has more on his experience of staying at a Catholic Worker house in Northern California. Read his earlier instalment here. Lexi Fretz tells a moving story of her experience giving birth to a tiny short-lived daughter born at only 19 weeks of pregnancy. And Big Blue Wave blogger Suzanne F. argues that anthropology could be a useful approach for pro-life advocates to take. For decades now, pro-lifers have been arguing for the humanity of the unborn both from a theological and a philosophical perspective. And I think we have done a very good job. But obviously, not good enough. I think anthropology could be another approach that the pro-life movement could use to go beyond this rationalist discourse. I propose that by exploring the idea of "what is a human being" and "what is a person" we can convince them to accept the humanity of the unborn. New International YCS secretary-general Francois Mendy proposes the movement's 'review of life' method as a basis for the 'new evangelisation'. Catholic Mom blogger Lisa Hendey is offering a sneak peek at New York Cardinal Timothy Dolan's new ebook Praying in Rome to be published tomorrow US time. The book recounts Cardinal Dolan's experiences at the conclave that elected Pope Francis. The book can also be pre-ordered here at Image Books for $US1.99. On the subject of popes and simplicity, it's worth noting that this past weekend brought an important milestone. June 30 was the 50th anniversary of the last papal coronation, the elaborate ceremony in which pontiffs were once invested with a three-level tiara, or crown, said to symbolize the church militant, triumphant and prayerful. One can find footage of the event on YouTube, reaching an apex with the famous rite in which the master of ceremonies fell to his knees before the pope with a smoldering cloth, and as it's being consumed, reminded him, "Sic transit gloria mundi" -- "So go the glories of this world." The problems that Betty Friedan outlined were real. Industrialization and the consumerism of the 1950s meant that the American household was reduced to little more than a comfortable hotel, where people slept and perhaps ate a meal or two while conducting their real work elsewhere. Little surprise that women felt stifled and unfulfilled by the role of glorified purchaser. And for Friedan, self-fulfillment was paramount. Women could not be “fulfilled,” she believed, unless they held meaningful paid employment. The home was no longer enough to provide fulfillment. But what do these women who have followed Friedan’s advice—divorced, childless, grandchildless—have to show for their “self-fulfillment”? The modern American woman who has tried to follow Friedan’s command to pursue a career and raise a family on the side finds herself in constant conflict with her own nature. For inside most if not all women lies a powerful desire to have some children and take care of them. In trying to straddle the worlds of career and homemaker, today’s woman finds stressed, tired, and, according to most studies, wanting to return home to be with the children. In her later years, she is more likely to be alone and separated from her children and husband. Stefan Gigacz is preparing a PhD. at MCD University of Divinity, Melbourne, on the role of Joseph Cardijn at Vatican II.